I don’t think I’ve developed my fabric storage to the point where I’m entirely happy with it. It’s ever evolving depending on my space, my bins, and my needs. Here’s how I store my fabric now in case you’re interested. When I get new fabric in, usually I buy a yard or yards if it’s for a particular project. They get put into a bag until I have enough to wash. Then I wash it and, if I’m quick, fold it right after. If I do this, I won’t have to press. If I don’t and it sits a bit, I’ll need to take it over to the ironing board and press it. I’ll fold it up and put it in with my yardage bins. These bins are not completely full but they are close to getting there. Before we moved, they used to be divided in color families. But I used my fabric to help pack the breakables so they got all mixed up. I’m slowly getting them back in the color families but I’m not working real diligently on it. Basically when I’m in the mood to pet the fabric, I’ll take them out and organize them according to the families. I was able to get most of the blues in that top bin on the right. Outside of these yards of fabric, I’ve got 4 smaller bins that I keep my scraps in. I talked about this a lot in previous posts but I wanted to get this all in one post. Bin #1 – scraps I can no longer use. They are so tiny and are used to stuff pet beds or mailing stuff or more recently packing. Bin #2 – Scraps I can use but cannot cut pieces out of. They’re bigger than 1/2 an inch and I use them for relaxing piecing when I don’t want to work on an actual project. This is the bin my DD has free reign to use whenever she gets in the mood. Bin #3 – Scraps that I can cut into pieces but are not large enough to fold. So nothing bigger than a 5×7 or 8×10 depending on my mood. Bin #4 – Scraps that are large enough to fold. These are fabric from quilt projects I’ve completed and have enough fabric left over to fold up or are fat quarters. 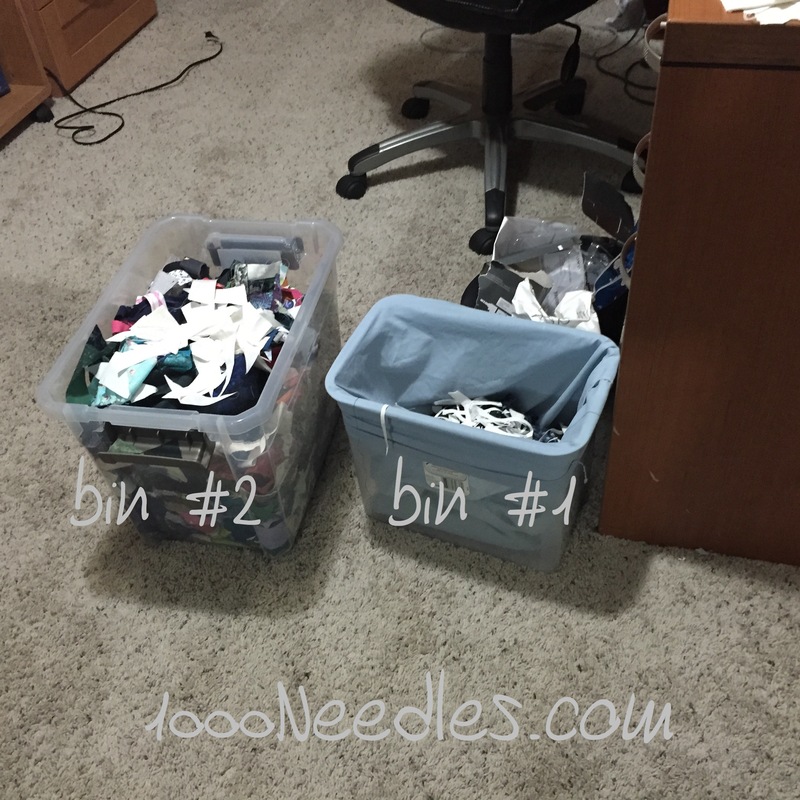 Generally, bin #1 and #2 are on either side of me when I’m sitting at my sewing machine or cutting fabric. 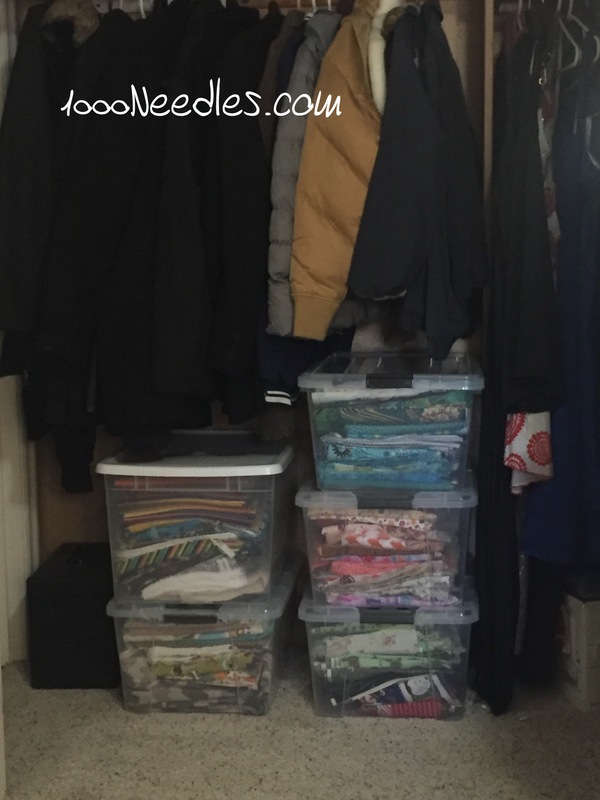 When I’m looking for fabric for a class or small project I start with Bin #3 and #4. When I’m gathering fabric for Charlotte’s scrapitude quilt (which I’m cutting for now) and Bonnie’s annual mystery quilt (starting on Black Friday) I start with Bin #3 and Bin #4. I also have a bin with baggies of cut fabric. I started to implement Bonnie Hunter’s storage system a couple of years ago but found that I didn’t like to cut just to cut. Or I would find that I would need some strip size that I didn’t cut. So I still have bags of strips that I pre-cut: 1″ strips for weaving, 1.5″ strips, 2″ strips, 2.5″ strips, and 3.5″ strips. In addition to strips, I’ve got a bag of 1.5″ squares for that day I’ll do a postage stamp quilt, a bag of 2″ squares, a bag of 2.5″ squares and a bag of 3.5″ squares. If I’m cutting a scrap down, I try to cut a square for one of those sizes while I’m at it. This keeps the scraps down in bin #3. And they actually come in handy when I’m working on Bonnie’s mystery quilt or Charlotte’s scrapitude mystery quilt. I guess if they ever get too full I can use them on a scrappy quilt project from one of the various books I’ve got. Or get a free pattern from Bonnie’s website or online. So far, I find the 2 mystery quilts a year has been a good way of using up the fabric in those bins. If I do not have enough in bin #3 and 4 for the scrappy mystery quilts or I can’t find that right piece for a project, then I go into the yardages. I started to do something a little different while cutting for the Scrapitude quilt this past weekend. Charlotte’s cutting instructions just tells us how much to cut of dark fabric, medium, and light. She’ll have a little more direction but that’s essentially it. So, for bin #3, to help me I separated out the dark fabric and cut those first before going into bin #4. I started with the darks not because those were first on Charlotte’s instructions but because I can easily pull the darks out. I’m still cutting the darks but the plan is to go into yardage if I need to. Then move over to the lights and then the mediums. For this project, I’m not staying within color families, I’m going to see how it turns out by just looking at values. I want to see what happens. Hmm. I like your idea of a bin for big enough to fold and several bins for smaller. I do a lot of precutting, but also sometimes wish for different sizes. I think I’ll keep cutting the smaller, but start a bin for big enough to fold! Thanks for the idea.